September was one of those months I was glad to see go! It was filled with questions, uncertainty, and set backs. This school year we’re trying to figure out what the best education model is for Ryan. Being in a special education class and going into regular education for related arts and other non-academic programs during the day no longer seems to be the least restrictive environment for him. Yet, how will he accomplish more of the regular education academics and how will he do with changing the routine? Are we pushing him too hard? How can we make his academic journey challenging without causing too much anxiety? 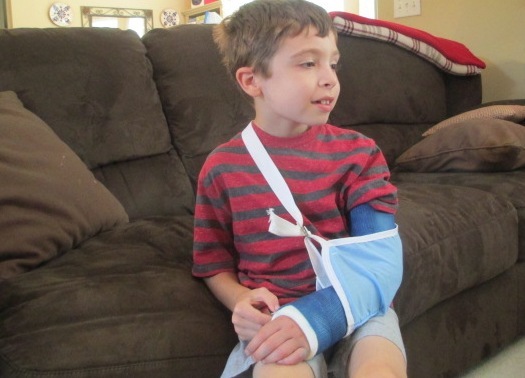 Then, on Labor Day, Ryan broke his arm when he fell off his swing in the backyard. More set backs in sleep, eating and mood. Our experience at the pediatrics emergency room at the local Children’s Hospital was exceptional. It was worth the 30 minute drive. I would encourage all parents of children on the spectrum to plan ahead where they would take their child in case of an emergency. Ryan was assigned a child advocate and got to watch Toy Story on the tv while they x-rayed his arm and put him in a cast. His experience was far from traumatic. Going home with a heavy cast on his arm was a different story. It was difficult helping Ryan when he couldn’t communicate clearly what he wanted and needed. Last week, Ryan got his cast off and I’m seeing glimpses of a happy, smiling Ryan again. He can go back to swinging on the playground at school (I’m still nervous about him using our swing at home. ), which had a calming effect on him during the school day. He can sleep better. He can get dressed better. He can run around again, dribble his basketball, play tag, play chase and tickles, and play catch again. 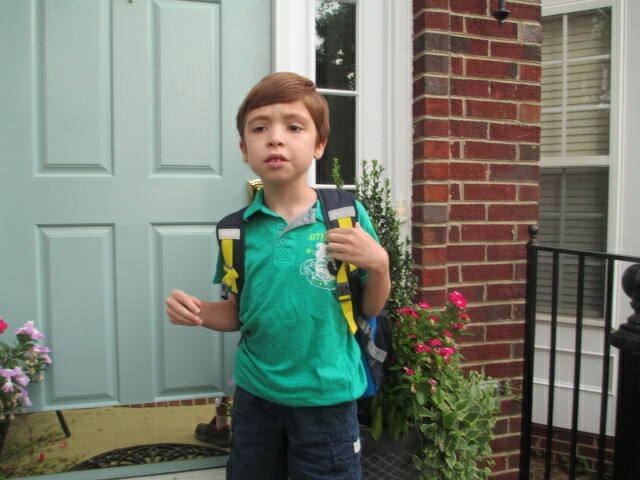 In one week, is Ryan’s IEP meeting where we will discuss how we think he will learn best during second grade. We just keep moving forward, and sometimes backwards, as we make our way through this hectic journey into the world of autism. Ryan graduated from Occupational Therapy today. It was a little sad to say good-by to everyone in the office. Ryan and I have been going to Touch Stone Therapy once a week since he was one and half. At one point, we were going twice a week. It started with physical therapy. Ryan was a late walker. Then we moved onto O.T. Ryan needed lots of work with his fine motor skills. I remember him learning to stack blocks, pulling small objects out of putty, and reaching into buckets of sand and rice. Later, he practiced drawing and writing. 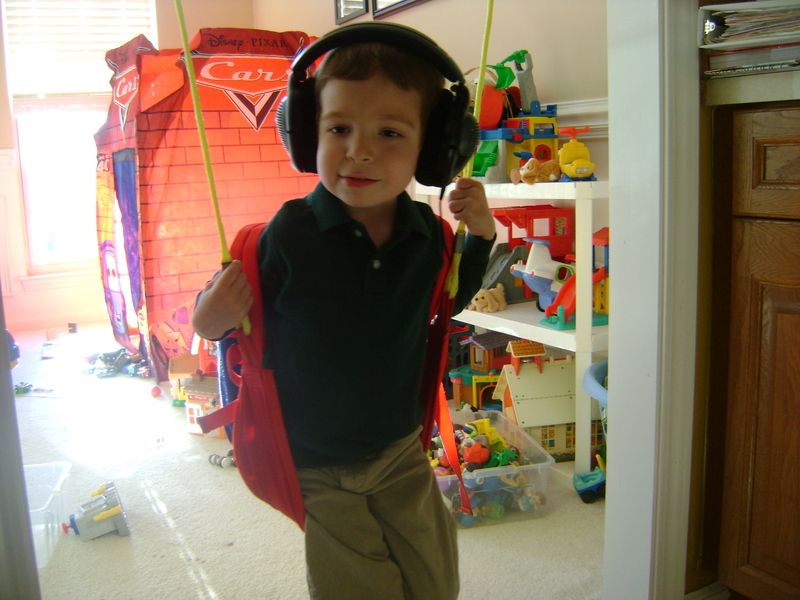 But most of all, Ryan needed help with his sensory processing disorder. Ryan was hyper sensitive to sound. Every time the phone or doorbell rang, Ryan cried. He didn’t want the tv or radio on, and we had to pull our clothes out of the dryer before the bell went off. He didn’t want to leave the house. He was on sensory overload in stores and restaurants. So we began a daily sensory diet of brushing, swinging, and listening therapy. We brushed Ryan’s arms and legs with a little rectangular plastic baby brush. This helped to desensitize him. I have pictures of Ryan sitting on his indoor swing listening to his special cd’s through his headphones. The music helped him to tolerate different sounds. But when I look back on our years at Touchstone Therapy, I think what will always stand out for me is the time Ryan spent in feeding therapy. I have to thank his therapist, Courtney, for all she did to get Ryan to begin eating a healthy diet. 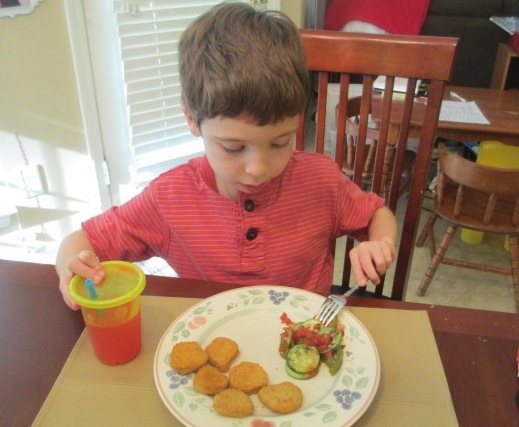 Because of Ryan’s sensory issues, he had a very limited diet. He couldn’t stand certain textures in his mouth. He had an aversion to the different shapes, colors, smells and temperatures of food. For a long time, all he would eat were cut up hot dogs, vanilla yogurt, and purple grapes. It took Ryan a year and a half of weekly therapy sessions to begin making progress. Each week, Ryan played with the food, put it up to his mouth, smelled it, put it on his tongue and spit it out. It was huge progress when he started chewing and swallowing new foods. Now Ryan eats a normal, healthy diet. 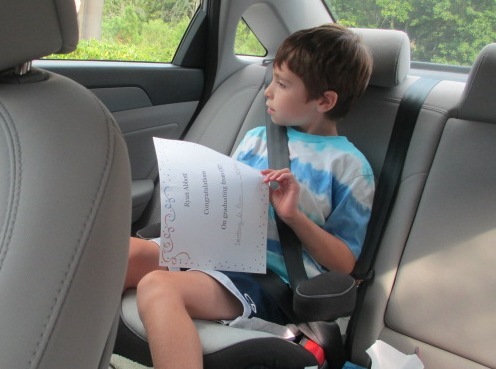 Today, Ryan walked into the waiting room with his graduation certificate in hand. I tried to take a picture of him with Courtney, but Ryan kept running away. He is terrible about getting his picture taken right now. All it takes is for one person to try to take his picture with a camera that has the flash on, and he refuses to get his picture taken for a long time after. He is also going through a phase where he does everything he can to give his Mommy a hard time.I tried to secretly snap a pictures when he gave Courtney a hug. Later, when we were sitting in the car to go home, I showed him that my camera doesn’t flash and tried to take a picture of him in the back seat. He did not want to look. Ryan is still sensitive to sound and prefers to stay home. But now he’s tolerating trips to the store and restaurants. He’s even walking through the airport and flying to see his grandparents. He has come a long way. Categories: Milestones, Uncategorized | Tags: autism, autism acceptance, autism awareness, sensory integration disorder, sound sensitive, what is autism | Permalink. 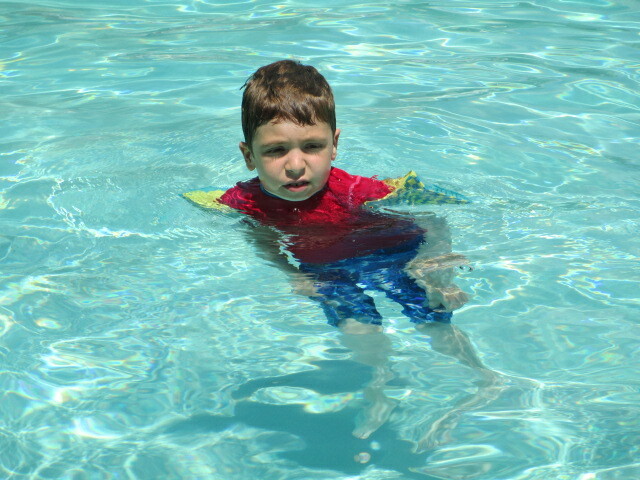 Summer is definitely hard, even though Ryan gets more pool time and play time. He usually regresses, and this year it’s in speech. He’s being a very quiet little boy. It’s hard to get a yes or no out of him. I know it’s just the summer time blues, a change in routine, anxiety about not knowing everything that’s coming up next. But it’s still difficult to watch. A few weeks ago, out of the blue, Ryan said to me “Principal Young got duck taped to the wall. It was so funny!” (Principal Young chose this stunt as a reward for the school raising money for a local charity.) That was the first of a series of small stories that Ryan started telling me about school. Ryan never talks about school unprompted. And if we do prompt him, he usually tells us that he had a good day in school, but no specific information. I was floored when he gave me this information about the principal. I immediately e-mailed his teacher. She said that he was also telling her small stories about home. For example, he went strawberry picking, grandmom and granddad visited, he ate chili for dinner. I used to mourn the fact that Ryan didn’t speak until he was three. When all my mommy friends were bragging that their child was saying big words and had an amazing vocabulary, I just wanted Ryan to say Mommy. I hated missing out on the joys of watching my child learn to speak. Then one day, close to Christmas break, Ryan had a break through in his three-year old special needs preschool class. His teacher put a microphone in front of him, and asked, “What does Santa say?” Ryan said “Ho! Ho! Ho!” The teacher found what motivated him to talk. A microphone. This was one of the first time Ryan spoke in class. I was so proud of Ryan’s “Ho, ho, ho!” that I had to tell grandparents and friends right away. That is when I realized that I wasn’t missing out on the joy. I was experiencing the same joy and pride as the parent of the typical child, but just a little later. In fact, the pride and joy was probably even greater because I had been waiting for it for so long. “I looked at a really good book at school. It was Arthur’s Teacher Moves In. After reading this journal entry, I realized Ryan is always going to struggle with his speech. He’s going to continue to take a step ahead and then two steps back. But I’ve learned that each step back never completely goes as far back as it was before. There is always progress being made. It won’t be long before he takes two steps ahead again. I’ll probably be writing down little stories again in no time. Categories: Summer, Uncategorized | Tags: autism, autism acceptance, autism awareness, changes in routine, changes in schedule for children on the spectrum, speech delays in autism, surviving the summer | Permalink. Yesterday was the first day in a month that we did not hear fireworks at our house. I think the Fourth of July fireworks season is finally over. We survived another year, and that’s really saying something when you have a sound sensitive child on the spectrum. Last year, on the Fourth of July, we thought we were very clever by booking a hotel room in a neighboring state where fireworks are illegal. We knew that the explosions in our neighborhood would be so loud and go on for so long that none of us would get any sleep. Ryan fell asleep easily at the hotel, and by the time we heard some distant booms from displays that were far away, Ryan was sound asleep and didn’t hear them. But this year, Ryan became hyper vigilant to firework sounds. If he heard a boom while in bed, even if it was far away, he would get up, turn on the light, and refuse to go back to sleep. Usually, this would happen the minute I said good night, turned off the light and shut his bedroom door. “I don’t want to go to sleep,” he’d say. “I’m afraid they’re going to wake me up.” His little body would tense up. His eyes would be wide open. He couldn’t try to relax until there were no more booms to be heard, usually some time around 11:30 or midnight. Some nights, I just couldn’t imagine who felt the need to set off these fireworks so late on a weeknight. I was exhausted, and so was my child who needed to get up early the next morning for camp. One time I approached my neighbor and politely asked if the fireworks display could end early. She looked incredulous that I would even ask such and question and said she has a two year old who is o.k. with loud booms and goes to bed at midnight. Why can’t my seven year old do the same? Well, this year at the hotel it didn’t go quite as well. We decided to spend two nights in the hotel. The only problem is, the residential neighborhood behind the hotel decided to have their own fireworks display both nights and the loud booms went on past 11. We couldn’t believe our luck. Was there no place to go to get away from the noise? So we are all exhausted right now. I feel like I’m up against a brick wall when it comes to fireworks. Somehow, they are very important to a lot of people and their attitude is everyone else needs to tolerate the noise. I was told by a neighbor that she has a special needs son and the he learned to tolerate fireworks. Maybe my son should, too. We’re already trying to figure out where to go next year on the Fourth of July. Any suggestions? We’re not sure a fireworks free zone exists! Categories: Sensory Integration Disorder | Tags: anxiety, aspergers, autism, autism acceptance, autism awareness, Fourth of July fireworks, sound sensitivity | Permalink. Most children on the autism spectrum suffer from a combination of anxiety and sensory integration disorder. Put the two together in various combinations and you often get a child who would rather stay home. And that is what we have been dealing with in Ryan since he was born. It’s so much easier for him to stay home than to go out into the world and deal with the bright lights, loud sounds, and unexpected surprises of the world around him. Just getting him out of the house and into the community has taken years of baby steps, breakthroughs, steps backwards, and leaps ahead. Mostly, we have been using what is known as exposure therapy without even knowing it. We have been slowly and steadily insisting that Ryan participate in the world around him. Last Saturday, we took Ryan to a children’s museum for the first time. It’s the kind of museum that looks like a small town. There’s a supermarket where the children can shop for pretend food, a fire hall with a life-sized fire truck, and a doctor’s office with x-rays, scales and exam tables. Of course, Ryan did not want to go to the museum. His anxiety is higher in the summer when the structure of school is gone. Knowing exactly what he’s doing everyday is calming for him. But we put him in the car anyway and drove to the museum, even though when we got there, his dad had to pull him out of the car and carry him into the museum. Once inside, Ryan instantly put his hands on his ears and stood next to the wall near the exit. Now, this is actually an improvement for him. Two years ago, he would have bolted for the door and had a huge melt down. 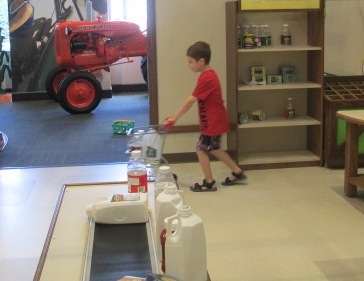 The visit to the museum would have been over in 5 minutes.But Ryan stood to the side and looked around him. 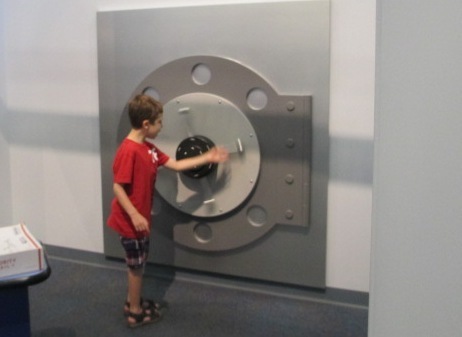 As he got curious, he began walking around the museum, watching other children and looking at what was around him, with his hands still firmly planted on his ears. I can’t pretend watching any of this was easy for me. I always hope that Ryan will walk right in and start to play. I was feeling frustrated and sad all at the same time, wanting my son to have fun and enjoy what all children get to enjoy. I second guessed myself and wondered if it was even a good idea to take Ryan to the museum in the first place. Why make him do something he doesn’t want to do? And I wondered over and over if I was missing something. Could I be doing something to make this all easier for Ryan? Should I explore anti-anxiety medicine again? It does work for some children. Yet the FDA has not approved any of these medicines for children at this time. He’s not old enough for Cognitive Behavioral therapy, although it has proven to work really well for anxiety. And why won’t Ryan wear his ear plugs today? Sometimes he just refuses. I kept trying to interest Ryan in one of the play areas and he kept telling me to go away. So I stood back and watched him from afar. Then, after 45 minutes of not playing, when Ryan thought I wasn’t looking, I saw him start to smile. He walked over to the pretend bank, got into the pretend car that was parked outside the pretend teller’s window, pushed a button, and made the capsule fly up through the pretend tube. I could not believe my eyes. I really thought we would end up leaving without Ryan playing at all. .
Next, after taking his hands off of his ears, he went inside the bank and sat at the tellers desk. He even turned the handle on the safe. He followed some kids to the supermarket, got a cart, filled it with food, and checked out at the cash register. He also spent time at the pretend cafe, cooking food in the microwave and filling a customer’s glass with a pitcher. 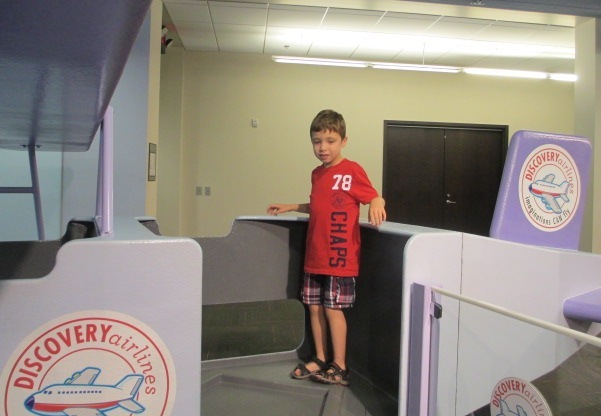 But his favorite part was the pretend airport, maybe because his daddy travels on airplanes a lot. 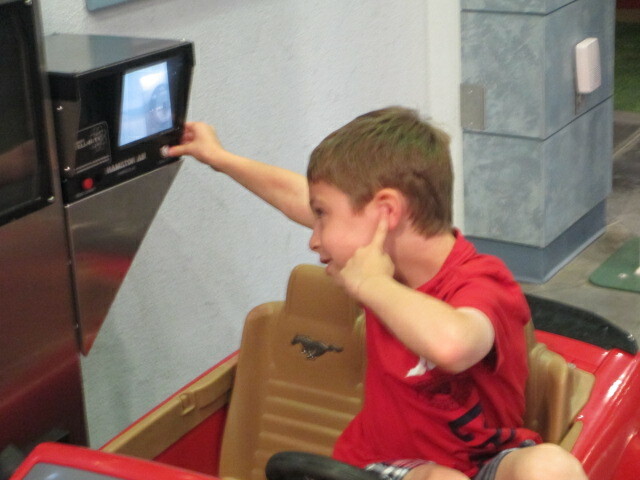 He kept running through the scan to make it beep and playing on the pretend airplane. About an hour into his play, they announced a dance party on the stage. They started playing loud music as the children danced to the rhythm. Ryan conveniently found that spot by the wall near the exit to take a time out. I never realized how loud things are until I had a son who was sensitive to it. But Ryan waited patiently until the dance party was over and then continued to play. In the past, he would have insisted on leaving. 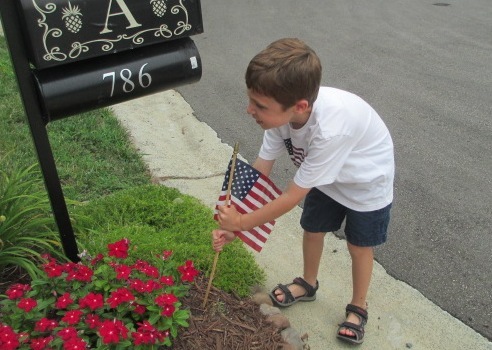 Ryan’s ability to handle going out into the community varies from day-to-day. It depends on how familiar he is with a place. It depends on his mood and if he’s feeling more out of sorts or insecure due to changes in his life or a lack of structure. In general, Ryan’s ability to enjoy kid’s museums, malls, restaurants, is getting better. I think Ryan will always enjoy his alone time and will always be the keen observer. But for now, we’ll just keep plugging away and exposing him to everything in the outside world that we can. Categories: Outings and Trips | Tags: anxiety sensory integration disorder school, autism, autism acceptance, autism awareness, changes in routine | Permalink. Ryan loves the cooking scenes in “Ratatouille.” He loves all of the little details of the kitchen. He notices things most people don’t even see, like a sign on the wall in the background. The other day, Ryan said, “Mommy, when are you going to make ratatouille?” I was thrilled. First, it was great to hear Ryan call my name and speak to me directly. And second of all, it was wonderful that he was asking for something. Ryan doesn’t always make us aware of his wants and needs. So when he asks for something, I’m just ecstatic. And what mother can refuse a child who is asking for a dish that has lots of veggies in it? Ryan isn’t a big veggie eater. It wasn’t that long ago when Ryan was on a food jag and would only eat a handful of foods that included hotdogs, strawberry yogurt, and grapes. So I wasn’t sure Ryan would eat the ratatouille. I found a recipe and read it to Ryan so he would know what was going to be in it. To my surprise, Ryan told me it wasn’t the right recipe. He said that the ratatouille in the movie was baked in the oven, not cooked in a frying pan. So I did some research on the internet and found a recipe called Disney’s Ratatouille. This is what Ryan wanted. The veggies were baked in the oven. I made the recipe recently for dinner. Ryan was excited. He ate three giant helpings of the zucchini, green pepper, onion, and tomato sauce dish. Then he wiped up the sauce on his plate with a piece of bread, just like Ego, the restaurant critic, did in the movie. The next day, Ryan asked for leftovers for lunch. Ryan doesn’t ask for much. I rememeber the first year that Ryan asked for something for Christmas. He just turned five and wanted a train that went around the bottom of the tree. How exciting to get him a gift that he actually asked for. And it must be exciting for Ryan to finally figure out how to ask for what he wants. It’s enjoyable to watch Ryan’s frustration slowly disappear. Categories: Milestones | Tags: aspergers, autism, autism acceptance, autism awareness, food jags, making wants and needs known, parenting, special needs | Permalink.